"Is public policy engaged in an elusive quest?" 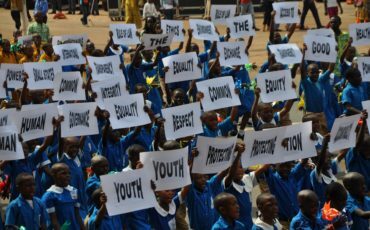 Public policy does not always achieve the desired results, but as Carole Nyemeck, 21, a Correspondent from Yaounde in Cameroon writes, the fact remains that individuals and governments alike are policy makers with responsibility for shaping future generations. Public policy is concerned with and applied in every single bit of society, from health to education. Policymakers are asked to identify the pressing issues and needs of society and to tackle them in the most effective ways through thoughtful, hands-on and appropriate plans of action. However, can the fair governance of the common good and the quest for socio-economic justice ever be attainable through public policies? Globally, our societies have in common that in their efforts to fairly manage the common good and restate socio-economic justice they mostly implement imperfect policies and laws. Indeed, we are in a world where when you want to make justice reign, you create other injustices. In academia for instance, the affirmative action* policy that in some universities favours admission of women and minority groups as a means to redress past discriminations can become an injustice for male and non-minority applicants. On the same wavelength, the policy of preservation of African forests so that the entire world can survive environment deterioration can be an impediment to the economic development of Africa, which unlike America, Europe and even recently Asia, still needs to mobilize all its natural resources into its industrialisation and development process. Despite all the above, the picture is not always that cloudy. An African quote says that “Oldest marmites do the best meals”. Nevertheless, genuine and fledgling human action has purity that sometimes may produce truly outstanding meals. Indeed, the sound judgment, dedication and determination of Noah and not his experience in engineering made him build an arc that endured a rude and murdering flood. On the contrary, the builders of the Titanic were used to constructing solid and enduring ships, but the one they built with that experience sank under an iceberg. That is to say that the best and most successful policies are sometimes the ones made with the charming mix of fragility and forcefulness of fledgling, fresh and uncorrupted – yet mature – minds. For instance, in 1961, presidential candidate John Fitzgerald Kennedy arrived at the University of Michigan’s campus on a cold October night at nearly 2 a.m. and pronounced the following campaign speech: “How many of you who are going to be doctors…are willing to spend your days in Ghana? How many of you are willing to work in the Foreign Service and spend your lives traveling around the world?” That visionary speech is what gave life to the Peace Corps – a means for Americans to promote world peace and friendships through serving their country by serving abroad. Considering these points, we can understand that public policy works for the honest governance of the common good and the attainment of socio-economic justice for all. Nonetheless, the discipline does not always produce the desired results and there is no magical formula or catholicon* for enduring solutions at the needed time in any situation. Rather, we must know that not only governments or businesses, but every single human being is a potential policymaker, beginning with their lives and those of their families. Thus, when dealing with daily real-world policies in life we ought to keep in mind that the contribution and imprint we make has to be indelible and positively impactful for the lives of future generations, as the Peace Corps movement has been since its establishment. If perfection is an elusive quest for human nature, excellence in all we do is certainly attainable through the power and depth of dream, passion, competence, determination, perseverance, uncorruptedness and union. The free kindle ebook “Common Sense” of Thomas Paine. Catholicon: hypothetical remedy for all ills or diseases, once sought by the alchemists. About me: I am a student studying in Yaoundé, the political capital of the country. I am also a member of Cameroonian Student Achievers Club at the Yaoundé US Embassy, and wish to further my education in the United States. I have always loved the media universe and its components of radio, television, newspapers and internet. However, my first professional encounter with this world came recently, when I began volunteering at Radio Maria Yaoundé. "Here's how to celebrate Movember this November!"